More cool stuff is coming! 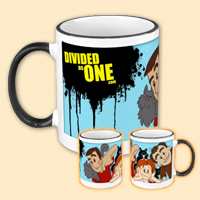 For now, we have a few items available at our new Zazzle store! Click on any of the listings below for more info or to make a secure purchase. Any profits we receive from our store will go toward replenishing our New York moving fund and creating new original video content. We don't have much control over the base prices of the items, but will always try to keep our own markup prices reasonable. Now you can add Bruno, Mia and Jerry to your Joe! Available in several colors and styles. 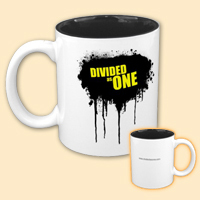 Start the morning right with your favorite brew in our DIVIDEDasONE mug. Available in several colors. 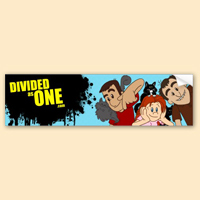 Bruno, Mia and Jerry find themselves in yet another sticky situation. Add some flair with a DA1 button! Available in several sizes.